Jennifer and her first horse, Buttercup. Unlike many horse enthusiasts, The Equine Behaviorist Jennifer Williams was not born loving horses. In fact, she was terrified of the first horse she ever met. Her dad had inherited his great uncle's old ranch horse, Buck, months before Jennifer was born. He lived with Jennifer's grandparents until Jennifer was four. When he moved to her house, she thought he was huge and was terrified! 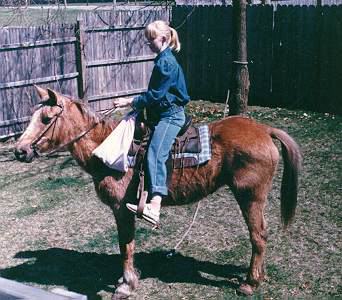 Jennifer was bit by the "horse bug" when she was eight or nine years old. She met someone at school who had horses and got to ride her Shetland pony. She was hooked! She came home, put a rope around Buck's neck, and happily sat on his back - although the only thing he did was walk over to the nearest tree and stand still. Jennifer showing Ibn Kochief (Chief) saddleseat. The Equine Behaviorist showing SS All Fired Up in Arabian Native Costume. When The Equine Behaviorist was eleven, her family moved into town. They gave their horse to a friend, but Jennifer started taking riding lessons. 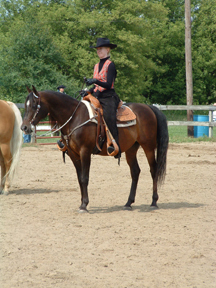 She took western riding lessons for about a year and then began riding saddleseat. She then inherited her great uncle's farm horse. Several months after getting Buttercup, Jennifer began working at the barn where she Buttercup lived. 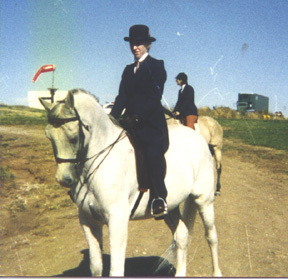 The trainer had 3- and 5- gaited Saddlebreds and Fine Harness horses. 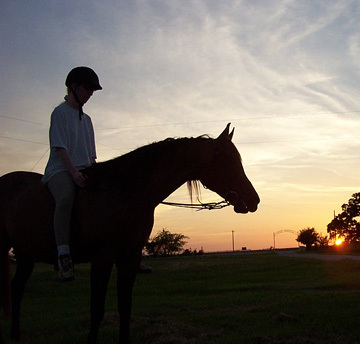 Jennifer groomed and rode for the trainer, and she learned a lot about poor horse care and poor training. While every experience gives you a chance to learn, Jennifer says that all she learned was things she would never want to do to any horses! She quit working at that farm and began working at the barn where she had taken lessons. She longed and groomed horses, gave riding lessons, and assisted the trainer with the Morgans, Arabians, and American Saddlebreds at the farm. Jennifer showing her gelding, RLA Jawhari, in hunter pleasure. The Equine Behaviorist showing her gelding, FS King Presley, in western pleasure. After Buttercup died of old age, The Equine Behaviorist got her first Arabian - a gelding named DC Agamemnon. He was a green horse and Jennifer really was not ready to train a horse on her own yet. But the barn also had two other Arabian geldings - Chief and Marcus - whose owner did not have time to ride. Jennifer got the chance to ride them both and spent a year showing Chief around the Kansas City area. 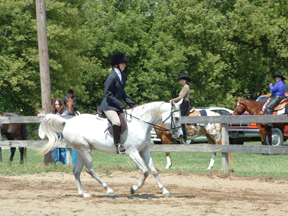 Since those days, Jennifer has ridden Saddlebreds, Arabians, Morgans, Quarter Horses, and even an Andalusian. 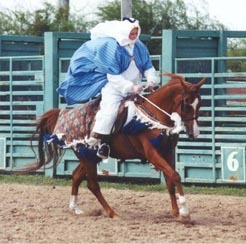 She has ridden and shown western and hunter pleasure, saddleseat, and sidesaddle. She has started taking dressage lessons and has dome some pleasure driving. Jennifer with one of her foster horses - a young, neglected foal named Gaia. 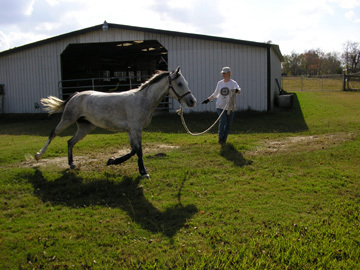 The Equine Behavior teaching a young horse to longe. While attending Northeast Missouri State University (now Truman State University), Jennifer earned a minor in Equine Science and a Bachelor's of Science in Psychology. At Texas A&M University, she obtained a Masters and a Ph.D. in Animal Science, specializing in equine behavior, learning, and welfare. 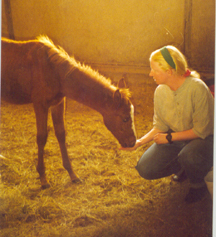 While working on her Masters and Ph.D., she conducted research on imprint-training in foals as well as clicker training in both young and mature horses. The Equine Behavior now writes - primarily for EQUUS magazine	although she has recently begun writing for Horse of Kings as well. She occasionally writes for other magazines. She is currently also working on two books and has plans for several others, and she is president and co-founder of Bluebonnet Equine Humane Society - a non-profit rescue organization dedicated to protecting horses and other equines in Arkansas and Texas. Prior to BEHS, she also ran another rescue for 6 years. Fostering for the rescues has taught Jennifer a great deal more about equine behavior than working for trainers, showing, training her own horses, and school. Jennifer and Elvis (FS King Presley).